Be the first to share your favorite memory, photo or story of Marge. This memorial page is dedicated for family, friends and future generations to celebrate the life of their loved one. Marge Virginia Sullivan, age 90, passed away peacefully on January 21, 2019 at The Gardens of Columbine, Assisted Living, Littleton, CO with her son by her side. Margie was born September 30, 1929 in West Monroe, Louisiana, to James Crawford and Elmer Carter Caldwell. She spent the first 18 years of her life in the West Monroe area where she enjoyed a country lifestyle with her parents and two siblings, Elaine Maxwell and Leon Caldwell, both deceased. She met her husband to be, Robert E. Sullivan, while he was driving through the area on business. Shortly thereafter they were married and returned to the Denver area to live. They were married in 1947 for 49 years until Robert’s passing in December of 1996. 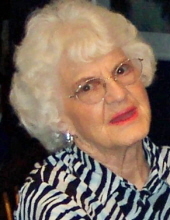 Margie assisted her husband, Bob, for many years with his business by managing the home office and phones. Upon their retirement, they enjoyed traveling, mostly in their RV. She was a caring homemaker and stay at home mom. She was a social being that loved to converse and “never met a stranger”. Family and friends were Marge’s passion and delight. She is survived by her two children; James E. Sullivan, Littleton, CO and Karen Esposito, Shelburne, VT; grandson, Andrew C. Esposito, Shelburne, VT and niece, Jean G. McAllister, Denver, CO, nephews Leon Caldwell, Jr. Clint Caldwell and Lanny Caldwell, West Monroe, LA, nephew Randy Maxwell, Vidalia, LA, and niece Lydia Maxwell Hern, Monroe, LA. There will be a Celebration of Life service for Margie on March 8, 2019 from 1PM to 3PM at the Riverwalk Clubhouse, 2751 W. Riverwalk Circle, Littleton, CO 80123 (near W Belleview Ave and S Santa Fe Drive). To send flowers or a remembrance gift to the family of Marge V. Sullivan, please visit our Tribute Store. There will be a family Celebration of Life. "Email Address" would like to share the life celebration of Marge V. Sullivan. Click on the "link" to go to share a favorite memory or leave a condolence message for the family.